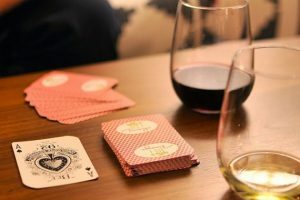 Drinking games for two people are definitely a way to additionally spice the things up in your relationship and have a lot of fun. The best thing is that they do not have a lot of requirements: a deck of cards and your favourite alcoholic beverage. 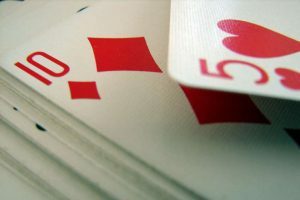 Higher/Lower is the simplest game you can play with your partner with only a deck of cards and alcohol as requirements. One of you is the dealer, who starts the game by turning over the card on the top of the deck. Then, the second player guesses if the next card from the deck will be higher or lower than the previously turned over card. 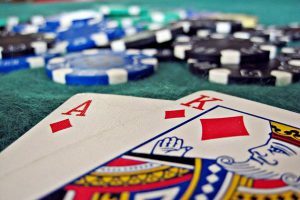 If the second player is wrong, he/she drinks, but if he/she is right, the dealer drinks. It doesn’t get any simpler than it is. 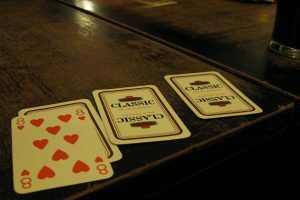 As most drinking games for just two people are modifications from original games, the popular Go Fish has been adjusted so that two people can get really drunk. The game is played like normal and whenever you or your opponent gets a pair, you take a drink. If you don’t have a pair when your opponent asks you, you also take a drink. But when you get what you needed, your opponent drinks. This means that when you ask your opponent for a pair and they have it is the only time you don’t drink. The game ends when you are out of cards and the loser has to take as many shots as the winner has pairs. Drink responsible, relax and do not drive after playing one of these drinking games for two people! War has become one of the most popular drinking games for just two people. The difference between the standard and the drinking card game War is the alcohol. The deck is divided equally to both players and each turn, you both reveal the top card of your decks. Each time you enter a “war”, the loser (the one with the lower card) takes a drink equal to the difference in fingers. For example, if you have an eight and your partner has a three, he/she will need to drink five fingers up against a glass of the drink. With that said, be careful choosing what the loser is going to drink, so you won’t get a headache after the first loss. To play this game, you will need a deck of cards with all four aces removed. Depending how long would you like the game to last, line up from five to ten cards (face down) in a vertical line. Next, line up the four aces you have removed horizontally (face up), which are the horses. Then, both of you put alcohol-bets on any horse you like and let the race begin. The dealer takes what’s left from the deck and starts turning the cards over. If the card he/she draws is heart, the heart ace moves up once. This continues as long as one horse finishes the race (reaches the end of the vertical line). Wondering where’s the alcohol? If your horse wins, you pass out your drinks to your opponent, but if you lose, you take a drink for every bet you have placed in addition to the drinks that were passed to you. If you two are familiar with the iconic card game Uno, the Druken Uno is a modified version that is played with a bottle (maybe few bottles) of alcohol on the table. The rules of this drinking game are simple. Everytime your turn is skipped or the other player plays a reverse card, you take one drink. You also take a shot when your opponent changes color. When you draw cards from the stack until you draw a card you can play, you need to take a drink for every card you have drawn. If you fail to call Uno with one card left in hand, you draw 5 cards and 5 shots. The first one to call out Uno is the winner, but the loser may also feel like the winner after so many drinks. This is really simple and very fun game to play. To start this game, you need to remove three queens from a typical deck of cards and leave only one. Shuffle the deck and both of you start drawing cards until one of you grabs the queen. When you or your opponent got the queen, there are three things that you can do: take a shot, perform a dare or drink a nasty mixture of alcohol you two have previously agreed and prepared. The game continues until one of you drops. This game is played by two people and requires a deck of cards and a lot of beer. To begin, one of you needs to be a dealer and to deal out 13 face-down cards in a pile. The dealer keeps the remaining cards in a pile. Then, the dealer takes the 13 cards and flips them over, one at a time. When a jack is flipped over, you drink one drink. For queens 2, for kings 3 and for aces you take 4 drinks. For all cards you have taken a drink, add the same amount of cards to the 13-cards pile. Cards from 2 to 10 are drinks-free. The game is over when the pile of 13 cards counts no card. For more fun, play this game with shots instead of beer, but keep in mind that the next day you will most certainly have a headache.